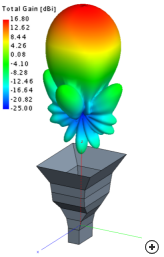 Antenna Magus Version 5.4 released! 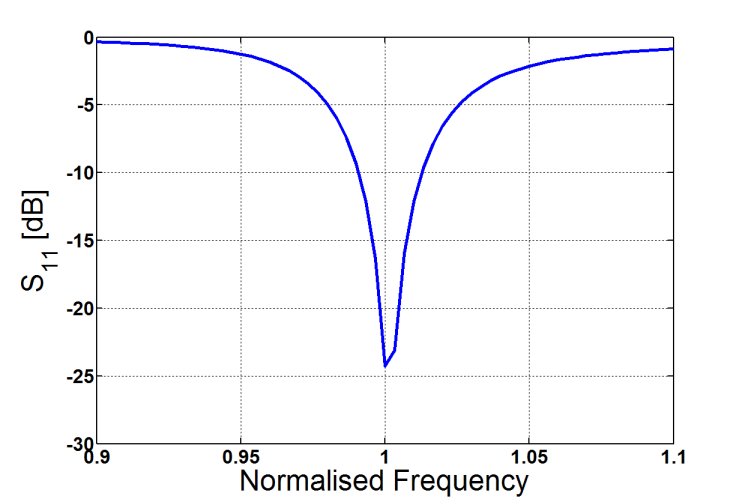 Version 5.4 sees the release of eleven new antennas (taking the total number of antennas to 277) as well as a number of new features, improvements and bug fixes. 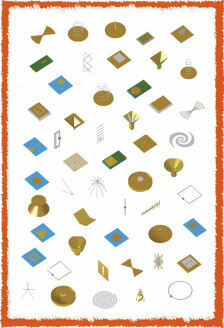 In this newsletter we will briefly look at some of the new features and antennas that have been made available. 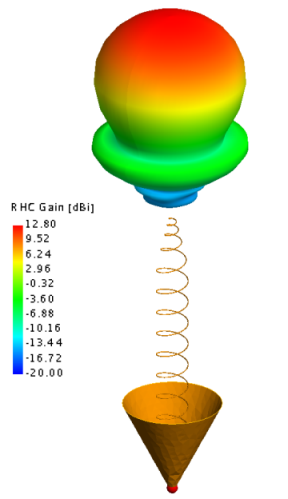 More detailed information on these antennas as well as feature extensions can be found in the full release notes. 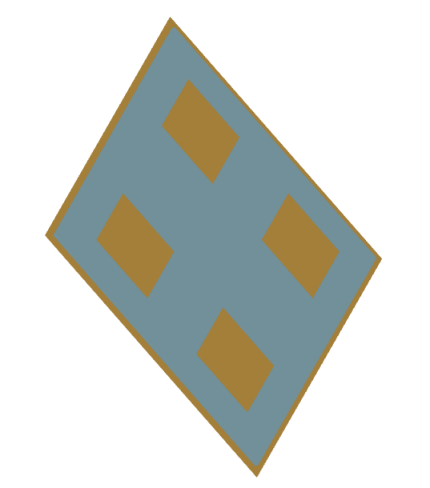 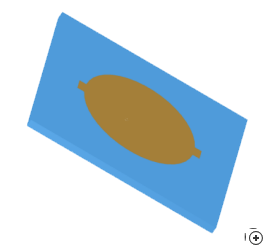 A number of small features have been added with this release. Here is a short overview of two of them. 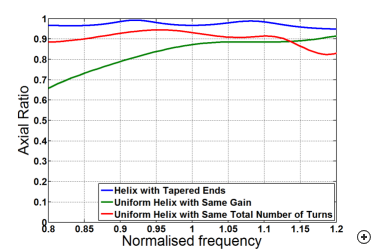 It is now possible to scale designed values to a new frequency before exporting a model of the antenna to a 3D CEM tool. 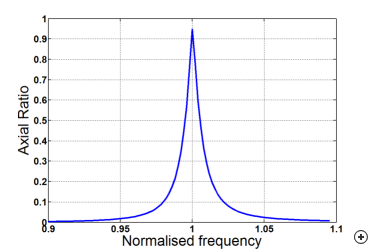 Where the frequency range of a specific antenna is too limiting and where the antenna structure does not contain dielectrics, this scaling can be very effective. 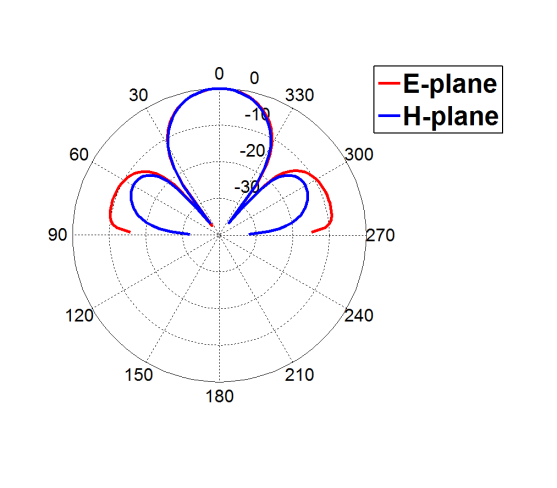 In cases where dielectrics are included in the antenna, some additional modification of the parameter values may be needed, but the scaled design does provide an excellent starting point. 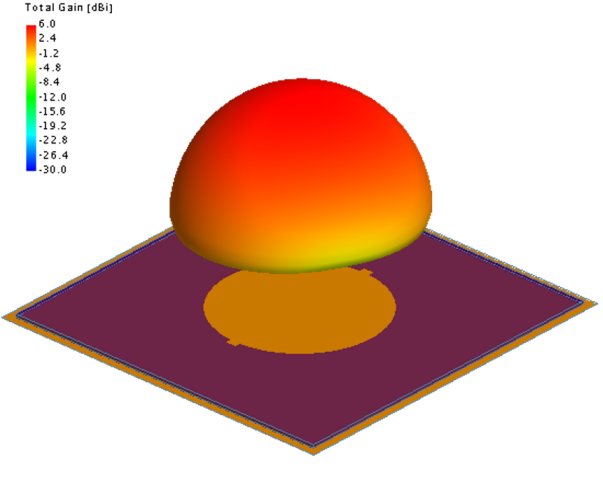 Scaling parameter values before exporting a 3D CEM model. 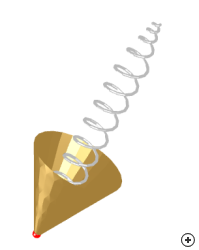 When importing data points from a file or from the clipboard into Antenna Magus, the number of imported points may be reduced by choosing to decimate the data. 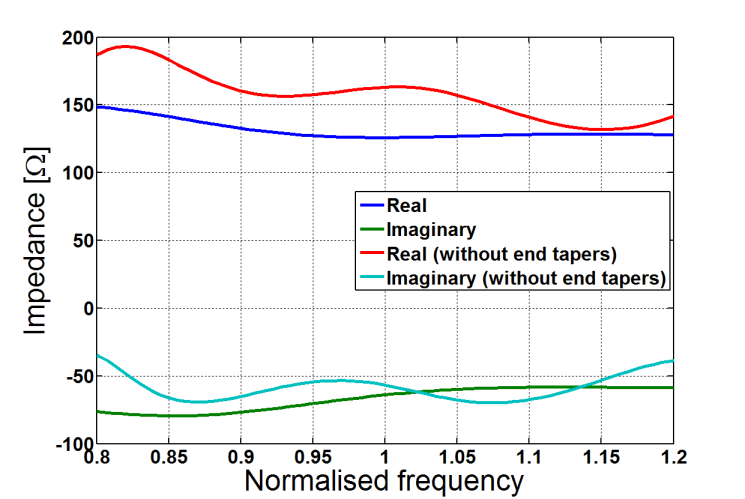 In the decimation process, the minimum number of points required to accurately reflect the underlying trace is determined and only these are stored. 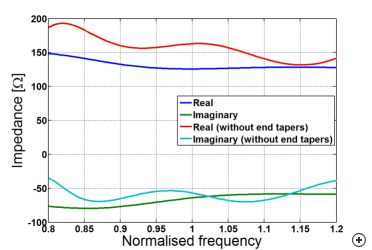 This makes data storage and processing a lot more efficient. 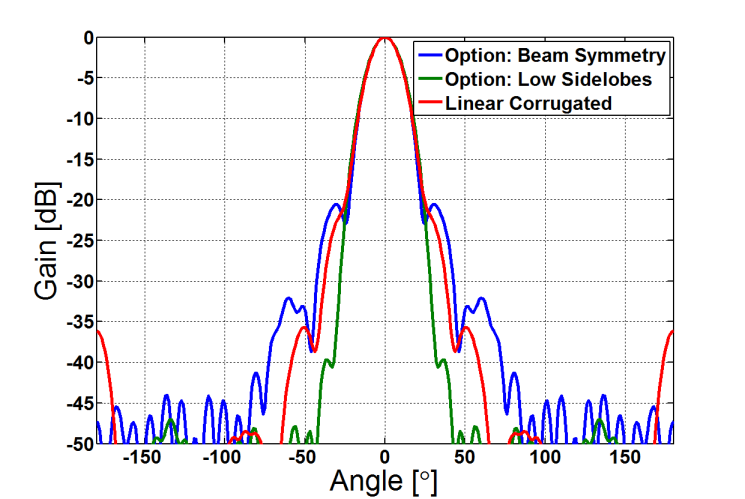 By profiling the flare, the mode content in the aperture is tailored to arrive at a structure that radiates a symmetrical beam with a low level of crosspolarisation and the highest possible gain and efficiency. 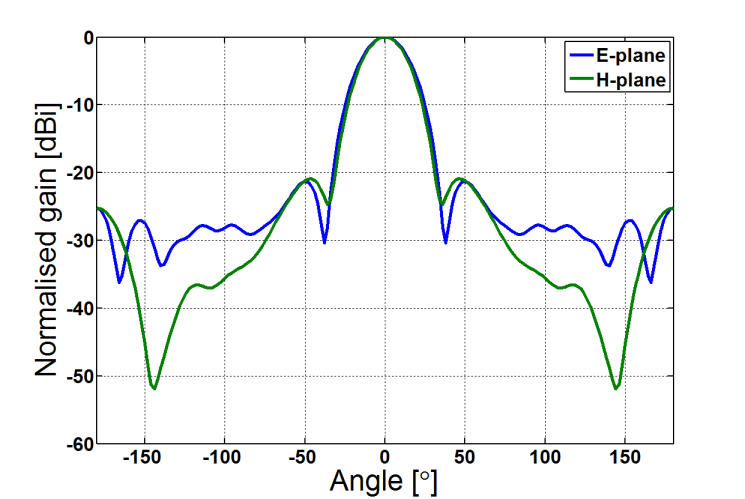 Various profile shapes, including cubic splines, as well as various analytical formulations (e.g. 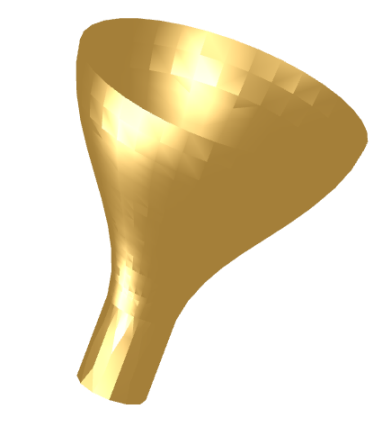 hyperbolic or sine-squared) may be used in smooth-walled, corrugated and dielectrically-loaded horns. 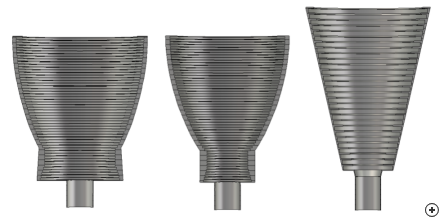 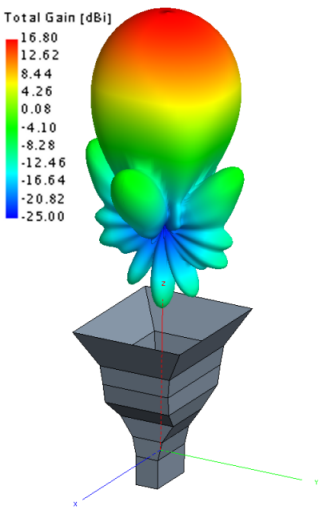 Although a single profile may be applied to the entire length of the horn flare, different profiles may also be used in different sections of the flare to form more intricate structures with specific aperture distributions. 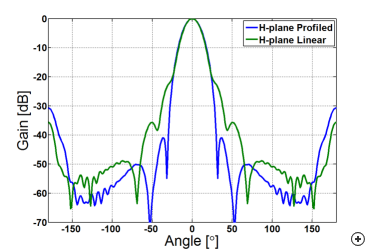 If properly designed, profiled horn implementations should be more compact (in terms of axial length) than un-profiled horns, while maintaining acceptble performance characteristics. 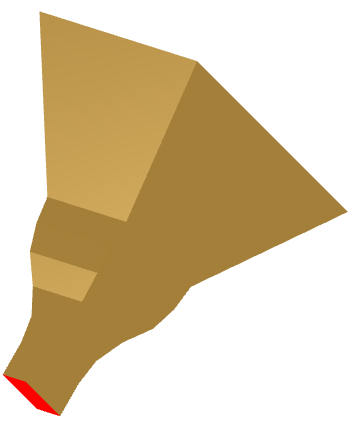 Profiled horns do, however, present certain disadvantages. 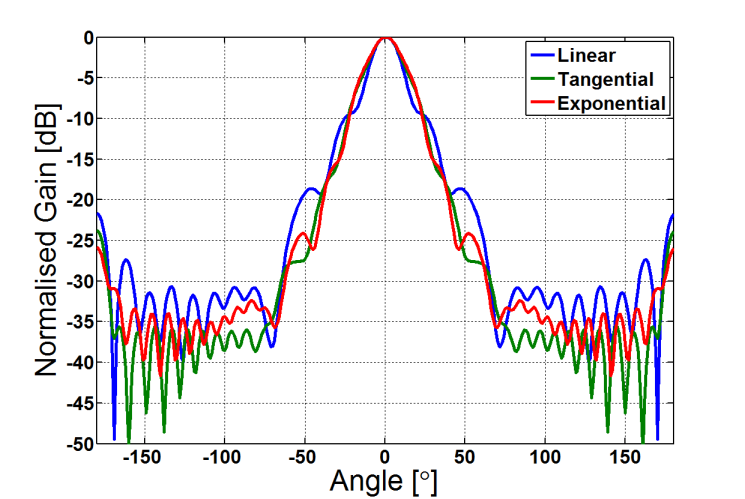 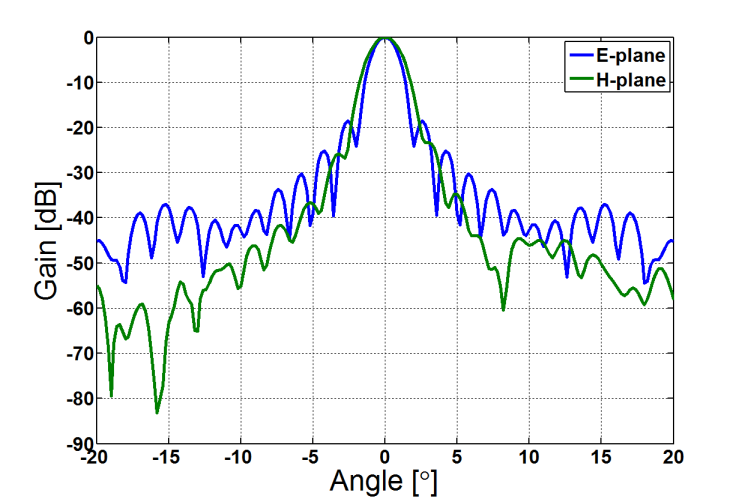 An increase in co-polarised sidelobes due to the excitation of higher order modes generated by the variation in the flare angle is typical (although this is generally only at frequencies in the upper portion of the band). 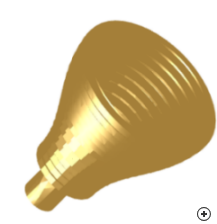 Let us take a closer look at a few of these horns. Image of the Profiled smooth conical horn. 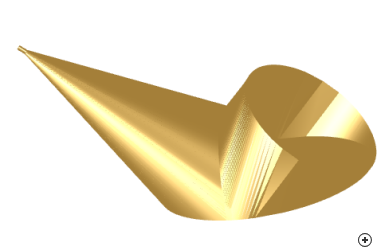 The performance of smooth-wall horns may be improved through a number of techniques, one of which involves profiling the flare. 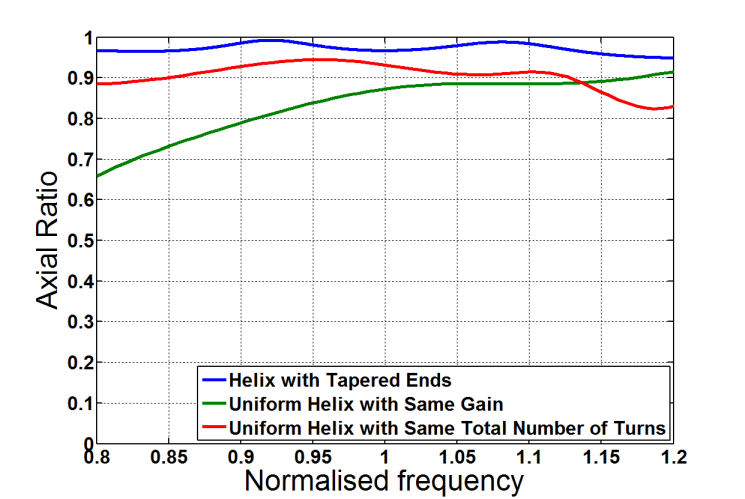 The ease of manufacturing at the millimeter-wave range is a huge advantage, as the fabrication of corrugated horns can become extremely costly and difficult. 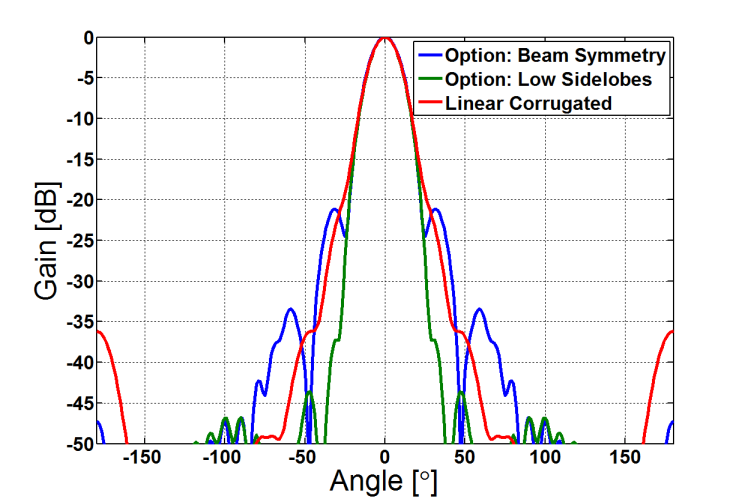 Other advantages include controlling the mode conversion and improving the symmetry and side lobe level of the radiation pattern. 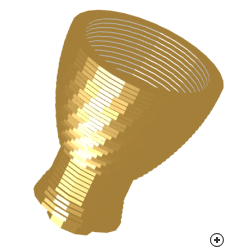 Compared to the linear conical horn, some of the profiled horns have improved pattern symmetry and reduced sidelobe levels, while others do not. 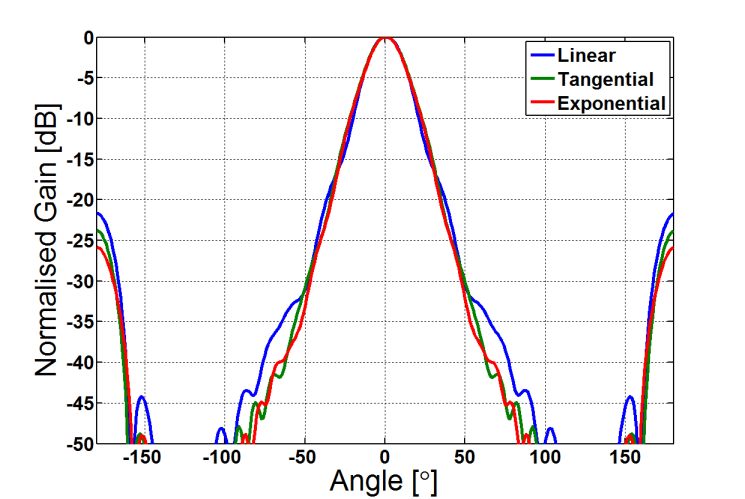 It was found that the tangential and exponential profiles provide the best alternative to the linear profile. 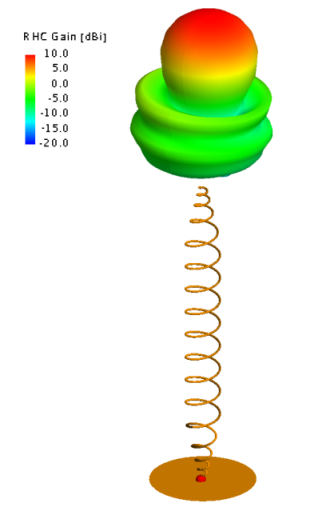 Available profiles for this antenna include sinusoidal, tangential, exponential, hyperbolic and polynomial. 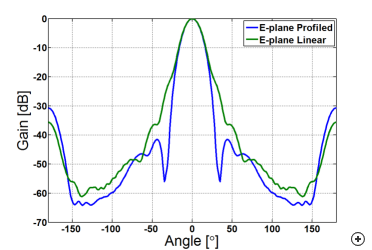 Variables controlling the shape of the profiles include a profile power index (p) and a profile addition index (A), which are chosen (where applicable) as Sinusoidal (p=2, A=0.3), Tangential (p=2, A = 0.6) and Polynomial (p=4). 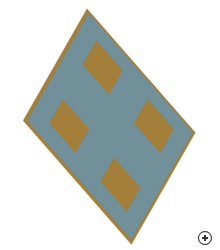 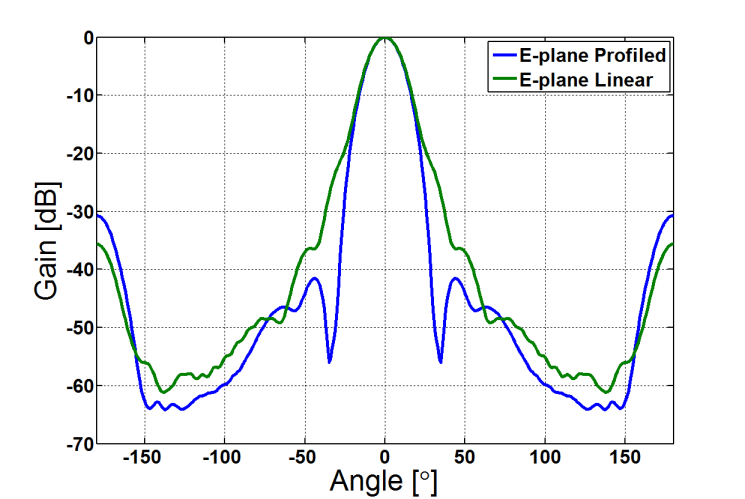 The introduction of the correct profile results can provide a more symmetrical beam, but at the expense of size. 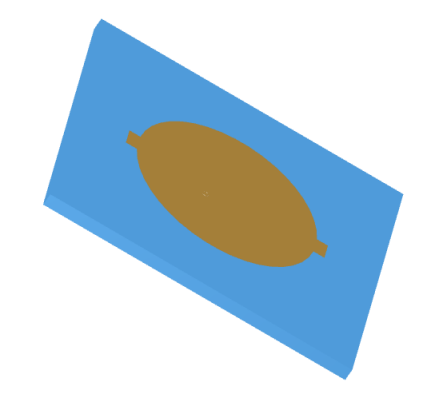 Image of the Sinusoidal profiled (Bowl) corrugated conical horn. The sinusoidal profiled corrugated conical horn antenna consists of a number of sections, namely, circular waveguide, mode converter, phasing section and a profiled Sinusoidal flare. 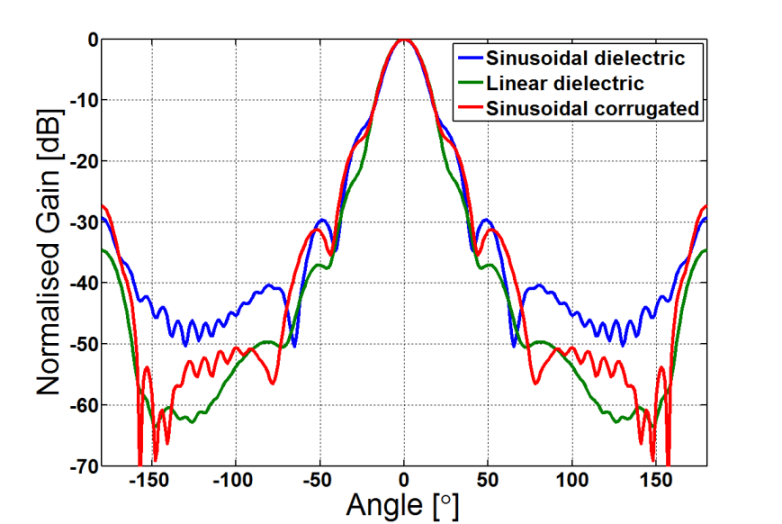 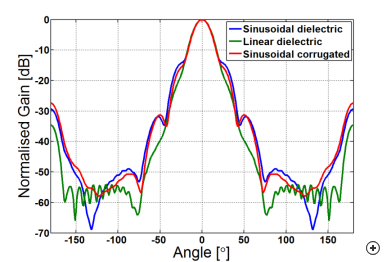 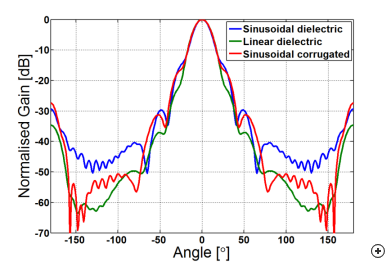 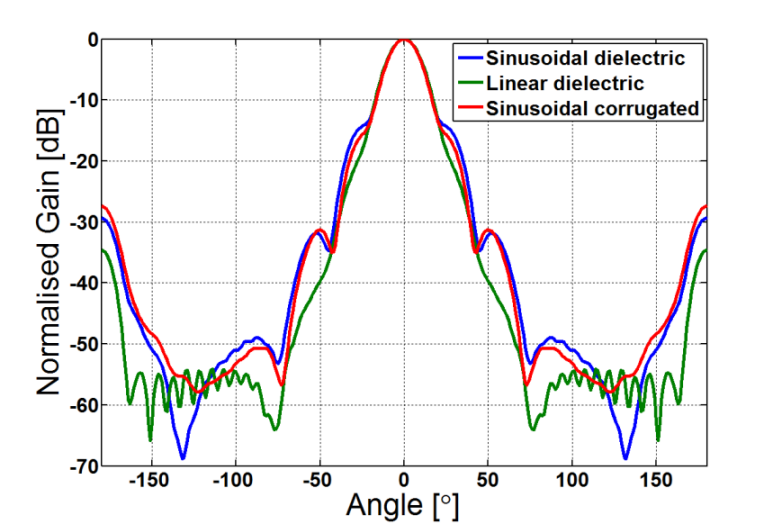 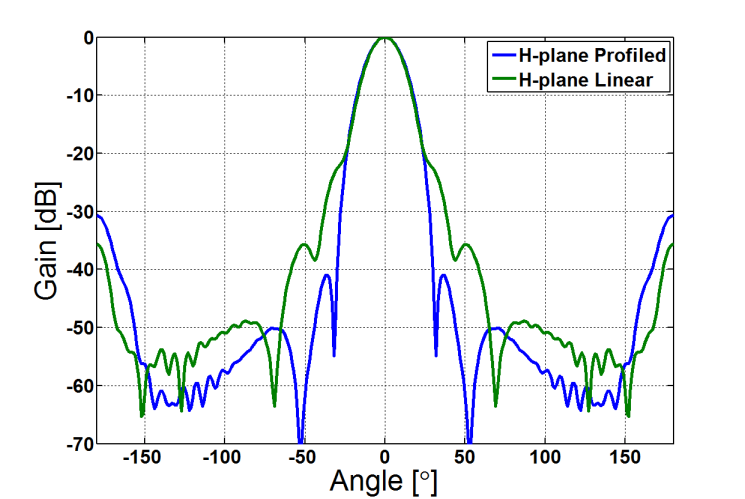 The shape of the sinusoidal profiled flare is controlled by a profile power index. 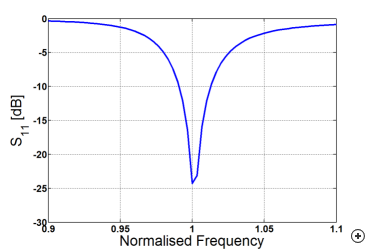 According to [Granet], the power index should be smaller than one for low sidelobes. 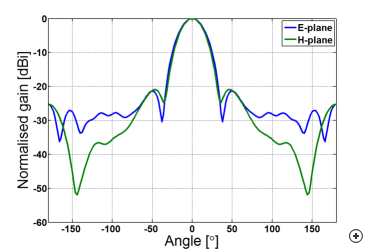 The optimised power index value was determined to be 0.8 giving the flare its characteristic ‘bowl’ shape. 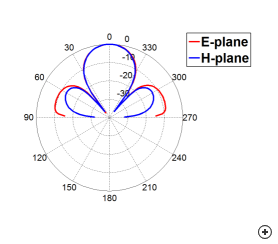 This antenna may be designed for two different radiation performance criteria, namely, low sidelobes or a symmetrical radiation pattern. Depending on the selected performance, the slot-to-ridge width ratio is designed to be roughly 3:1 (for symmetrical beamwidth design) and 4:1 (for low sidelobe level design), whilst the pitch (slot width + ridge width) remains constant. 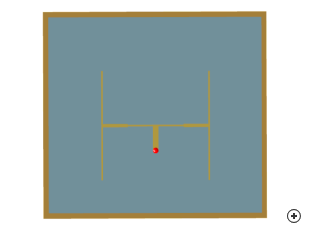 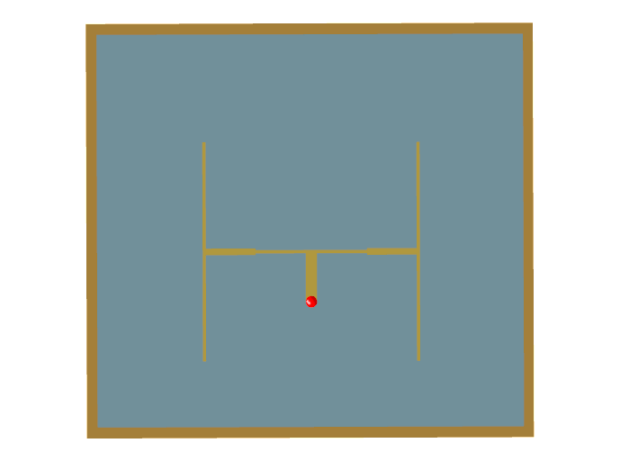 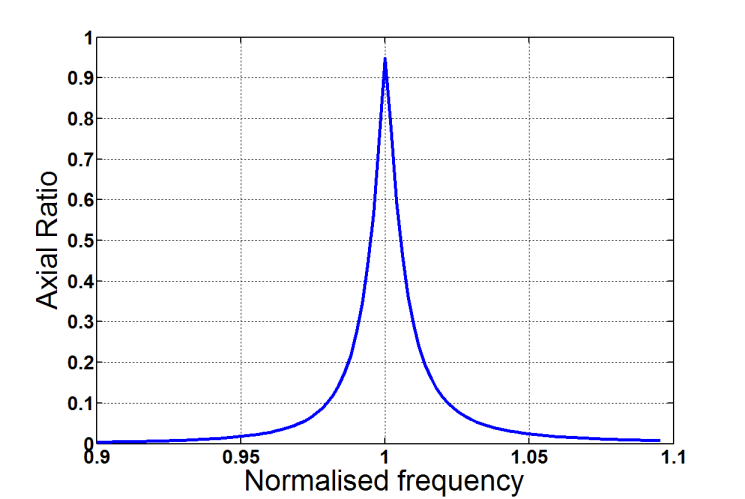 The pitch is roughly equal to a tenth of a wavelength at the centre frequency [James]. 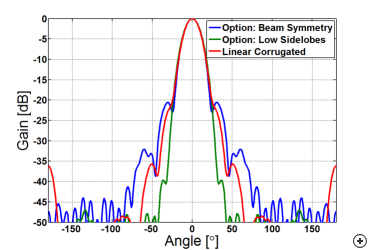 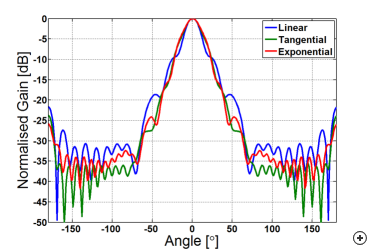 Below is a comparison between designs for the two performance criteria and the linear corrugated conical horn already present in Antenna Magus. 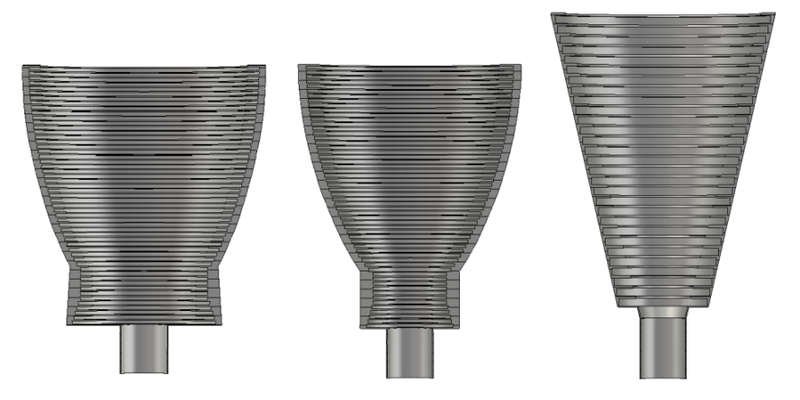 The structures compared are designed for 20 dBi gain and it is clear that the profiled horns are shorter than the linear horn. The profiled horns are roughly 17% shorter. Image of the Piecewise linear (PWL) spline-profiled pyramidal horn. 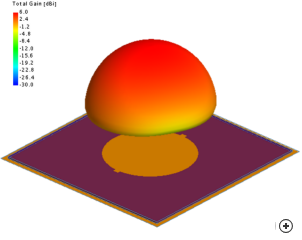 The geometry of a rectangular horn is more suitable for array applications as the geometrical efficiency within the array cell is higher compared to a circular horn. 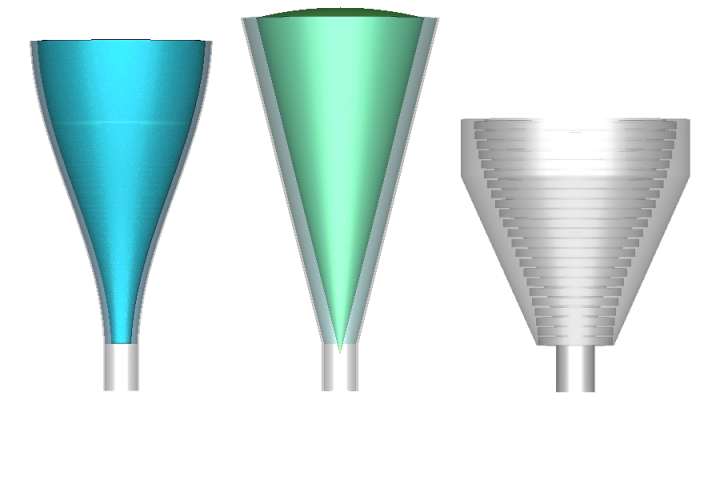 Conventional pyramidal horns have an aperture efficiency of approximately 50 %, but it is possible to achieve efficiencies close to 100 % by optimising the flare profile and, in turn, improve overall array efficiency. The piecewise linear spline profiled horn described here achieves an aperture efficiency of approximately 80 %. The horn consists of a rectangular waveguide section, a mode converter and a pyramidal flare. 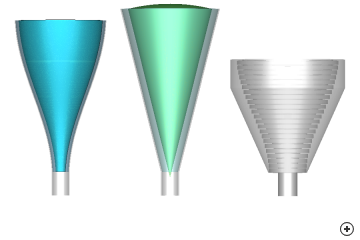 The mode converter consists of five PWL (piecewise linear) sections followed by the pyramidal flare to reach a specified aperture size. 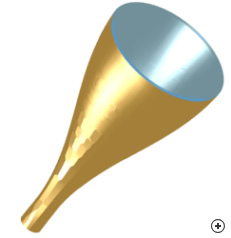 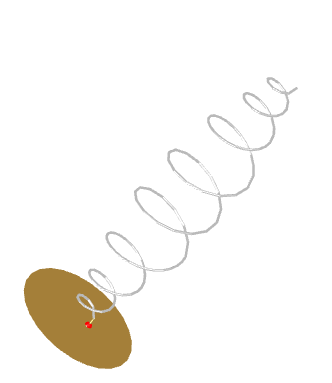 Image of the Conical horn reflector (Cornucopia). 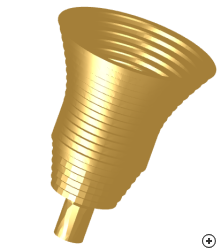 The Conical horn reflector antenna, a.k.a conical cornucopia, is a modified version of the Pyramidal horn-reflector antenna already present in Antenna Magus. 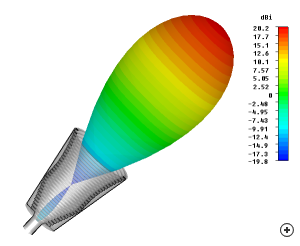 The Conical cornucopia is a combination of a conical electromagnetic horn and a parabolic reflector - hence horn reflector. The conical cornucopia has found preference over his pyramidal counterpart due to structural advantages and the absence of the high diffraction lobes which the pyramidal cornucopia produces at 90 degrees [Johnson]. 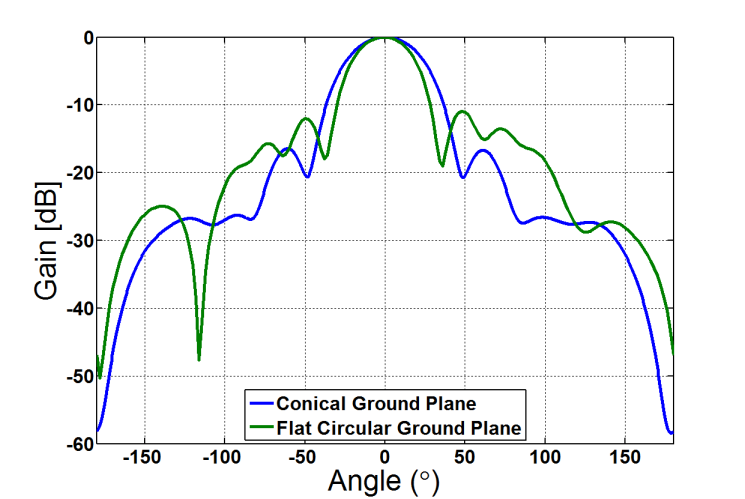 The antenna has no frequency-sensitive elements, so performance bandwidth is limited only by the feed waveguide; and linear and circular polarisation is possible. 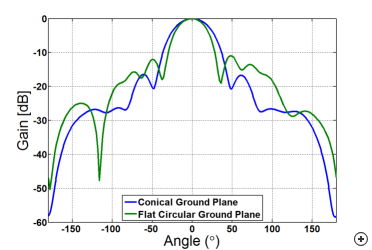 Since the aperture is not partially obstructed, as is often the case with ordinary front-fed dishes, aperture efficiencies of 80%, as opposed to 55-60% for front-fed dishes, may be achieved. 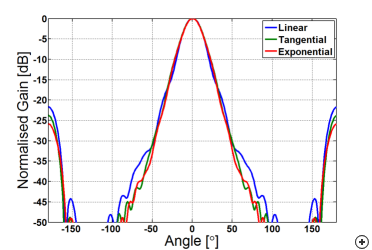 The disadvantage is that it is far larger and heavier for a given aperture area than a parabolic dish. Image of the Pin-fed 2-by-2 patch array with underside corporate feed. 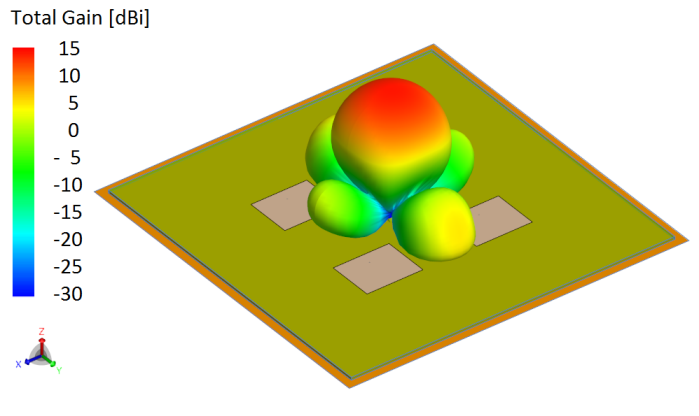 This 2 by 2 patch array design in Antenna Magus combines the design of the individual rectangular pin-fed patch element with the design of a corporate microstrip feed network. 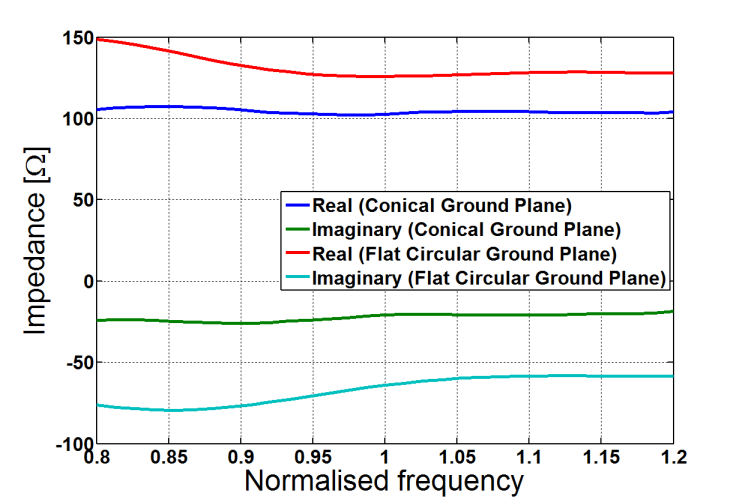 Not only does Antenna Magus allow to design for a specific substrate, one can also design for an input resistance between 50 Ohm and 150 Ohm. 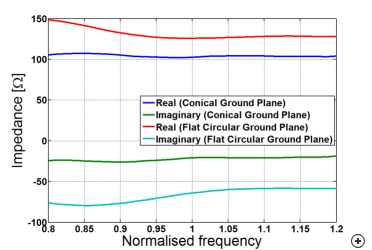 Two advantages of an underside corporate microstrip feed is a reduction in spurious feed network radiation and a reduction in antenna size (up to 30% in the E-plane when compared to the 2 by 2 microstrip patch array already present in Antenna Magus). 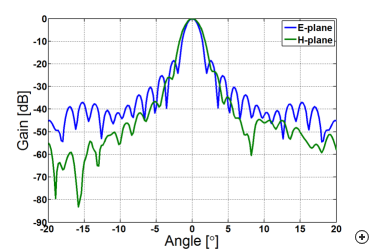 The antenna performance example which below is for a design of 50 Ohm input impedance on a 2.9% (in the medium) thickness substrate with a relative permittivity of 2.